The afternoon was cold and blustery, as several days before. A fresh snow was on the ground now. As I started on my journey, the sky was bright. White and grey clouds were streaking in from the west, quickly filling in the patches of blue. My face felt the sting of the wind wipped ice crystals. Yet, as I lifted my face to Creator, a warm and loving feeling fell on my face. It reminds me of when I was young and would come in from the cold. My mother would have a look of compassion in her eyes. Without a word she would place her hands gentle on my half frozen face . Her warmth not only felt good on my checks, but passed from her eyes to my heart warming me from the inside out. It was a feeling of great love and security. Here as I show my face to Creator again this warmth is felt, Aho. The snow is beautiful but very cold. The air temp has not been above 15F with wind chills not reaching above 25 below. The snow immediatley clumps and freezes to the soles of my still warm mocs as I start to venture across the field. I feel one with my ancestors today. I walk the land as they did. I have a white capote' coat on with my deer antler tip around my neck,and my favorite pair of mocs. My feet are greased to stay warm and dry. The wind howls and swirls the snow about me. Yet my heart is warm! I am happy to again leave civilization behind for the simple time on the mountain. Memories of my ancestors and how this land was - and for now, still is here on the mountain , rush in. Love fills my heart and my troubles fade. I am greeted by a single raven fighting hard against a strong cross wind. His jet black is contrasted against a patch of powder blue sky peaking between the thickening clouds. It makes me think of a dear friend. The raven calls loudly and I answer. I offer small pieces of bread I carry with me for my friends. I wonder where is the other. For usually there are two in this place.Then,another voice is heard behind me - sure enough here is the second. They fly on to some pines a small distance away. The ravens bring a smile. Not only beautiful to see flying over the white snow and in the blue sky, but it is my friend and I together again - two hearts as one. It is a good day! The field I cross has many snow drifts in it. The drifts look like ocean waves at their crest and ready to break on the beach. The crests vary from thin pointy tops to beautiful elongated lips reaching out over a foot past the wall of the drift. They curl down towards the earth. Unlike the ocean waves which would break at this point and crash down with a roar, these soft beauties are suspended for now in time - silent. Yet so moving to the eye and heart. Each wave is slightly different and time is taken to appreciatte this delicate art. As I approach the wood line, a different veiw is seen. Usually the dark trunks all blend together against a brown floor of leaves. The veiw is a collage of brown and grey shades. As a crowd of people blend together at a distance. Today is different. With a fresh crapet of white - the trees can be seen as individuals from a distance. It brings back memories of battle. The people fought together in war yet fought as individual warriors. Here is the place where the battle to save this mountain rages now. The trees stand tall as one forest - but I can see each individual one - their strengths and weaknesses. My mind drifts - will my one legged brothers be here next year to share this special time with me? An ache fills my heart and the sting of the wind brings water from my eyes. I say a small prayer for my friends here and step into the forest. For now my pain leaves to be replaced by the wonders here. I see sycamore trees fifty feet tall and three feet across. The trunks are brown at the base. As you look to the canopy now bare of leaves - the bark slowly gains white patches - at the top the bark is almost completely white with dark patches. How magnificent these trees look with a back drop of white snow and brown forest. As I move on the only sound heard is the constant wind. The song is changing every minute. It sings to me and talks softly ,and at times it howls to me. These are the messages of life - spirituality, love, and disipline. As I move on I reach a smal stream racing down a gorge. The stream is partially froze. The ice and rocks are topped by snow several inches thick. The rocks look as though they wear hats - snow puffs. The water rushes down the gorge with a soothing sound. The water has a healing effect on my heart today. The bank is lined with spruce trees. From the cold the needles have turned a dark blue. The limbs are bent down with the weight of the white snow - magnificent whites and blues with the sparkles from the sunlight hitting the ice crystals. I move deeper into this land of wonder. Here are the hickory and horse chestnuts. There bark is dark and rough. Browns and greys are the order here. I feel a strength always from these trees - today is no different. I smile and say thanks as I pass by my friends. My heart feels warm now as I cross a forest bench. Here are my old brothers. Tulip poplars 80 feet tall and white oaks just as high. The trunks are all over several feet thick. The poplars go starigth up to a magnificent canopy. The oaks bend and twist. These trees have been here before my father. It is like seeing friends from the third generation atleast! I value their strength and wisdom. They have survived nature s and man s furies here. They bare the scars of old battles. Some have bent limbs and scarred trunks. Others have parts of limbs missing or linbs missing altogether. Some bear the knurls from disease or insects. Some wear green moss proudly, as an elder is adorned in silver and grey. Yet all stand proud here today. 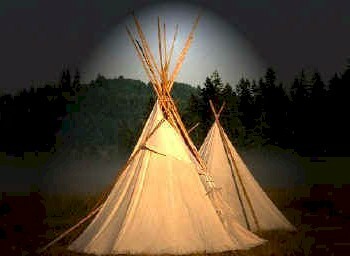 I am honored to be here with them and thankful Creator felt me worthy to be led to this place. I make an offering of tabacco and sit with my friends. As I leave on another path, I come upon a magnificent site. This mountain contains many granite outcroppings and cliffs. When only the stone is showing - still a wonderous sight. Today no words can describe them. A cliff rising from the forest bench about fifty feet high. From the very top the side wall is covered by ice. The wall is sevearl blocks long till it merges back into the mountain. At the top small cicles and transparent flows cover the strong grey stone. As it moves towards the forest floor the thickness of the cicles now is up to eight inches across. Several blendinging into each other. Further down th side it is one flow of rolling and bumpy ice - you can no longer see where on cicle stops and the other starts. The ridges and flows are capped with varying amounts of snow. It seems to the eye the ice is frozen in time - but as myself it lives. Slowly growing from the water (INA) mother feeds it through the splits in the rock. Slowly moving down to the earth from its own weight. As I headed out in to the field again I was sad to be leaving my friend, but happy for the gifts I was allowed to share this day. Little did I know there was more gift to be seen . I looked across the field to the west. The sun was starting to set and the sky was filled with white , grey. and geyish blue clouds streaked across the sky. Snow is coming again. Small areas of blue were still visible in this patchwork of clouds. At the edge of one of these openings was a winter bow! Only three wide bands of pink, light green and light yellow were visible. It was a wondeful gift. I had never seen one in winter here. Others have spoken to me of them - this was my first. It stretched across the sky from opening to opening. I sat and looked at if or a while.I gave a prayer of thanks. I was a rich person today. Rich in a way sadly most do not understand today here in the east.